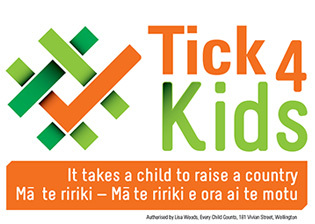 We collated policy measures from our Tick 4 Kids coalition partners and chose the most popular five to test our party candidates on. The following simplified scorecards cover education based policy, family violence, health, housing and income measures. Scorecards were produced by Dr Prudence Stone, National Children's Rights Advocacy Manager, UNICEF NZ. Original generation time 1.3834 seconds. Cache Loaded in: 0.0361 seconds.